Cities may not be able to lessen their 'concrete footprint', which prevents groundwater from entering the soil but maybe more city spaces can use porous surfacing to deal with this problem. Despite its shrinking greens, Delhi has significant tree diversity. Pradip Krishen, a naturalist, author and filmmaker, identifies around 250 tree species in the concrete jungle, in his book titled ‘Trees of Delhi’ published in 2007. 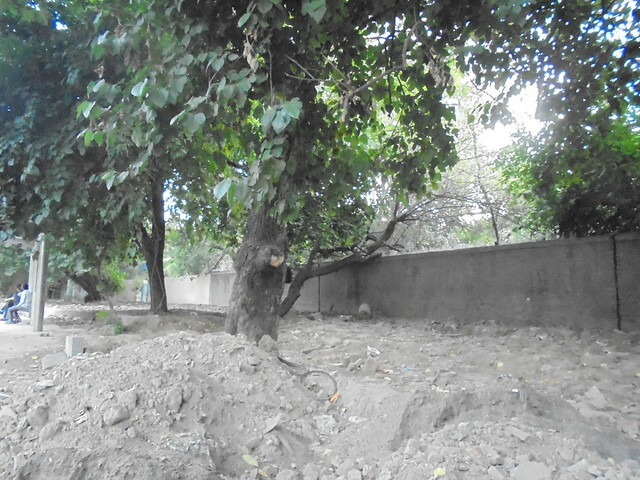 But these trees do not have the breathing room they need as the Public Works Department's (PWD) pavement tiling projects enclose trees completely in concrete. Unable to widen their roots, the trees do not last long enough and also weaken the footpath. Wide scale concretization of footpaths and spaces around the houses also reduces groundwater recharge. Not only are the trees put to strain but also the rainwater heads off as stormwater through the drains instead of seeping into the ground. The drying up of groundwater affects the trees and strains their growth. Stormwater drains overflow leading to urban floods and waterlogging. Often during flash floods, the water has to be often pumped out mechanically. The traditional approach towards this problem focuses not on recharging groundwater but on dealing with urban floods and on designing stormwater systems. The government spends crores creating bigger drains and desilting the existing ones before monsoons so more stormwater can be carried away. Considering that urbanisation cannot be reversed, can there be better designs to restrain its ill effects? There are not many examples of this in Delhi but recently, some individuals in the city have started efforts towards making water soak in naturally into the ground. A tree lover trained in social work, Padmavati Dwivedi is known for her work on motivating people to protect the trees in their neighbourhoods. 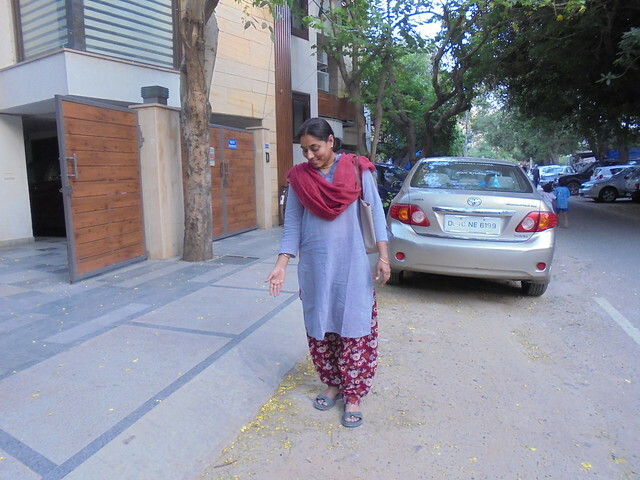 The first tree census in Delhi involving citizens goes to her NGO’s (Compassionate Living) credit but this wasn't easy. While many people were motivated with the idea of enhancing the green cover in the colony, some created trouble by not sharing information. She keeps a note of the pavements and trees in Sarvodaya Enclave, the locality she lives in. Today, she knows where rules are blatantly flouted and reports it to the authorities. Her unyielding route miffs many but works well most of the time. From being skeptical at some point, her neighbours and the authorities rely on her today. She speaks to contractors and builders at work cementing the premises. Those among them who are up to the mischief of cementing their backyard or frontyard keep a track of her whereabouts. She shares historical information about trees and worries about what happened to each tree in the aftermath of a storm. The official policy (Delhi High Court order 2009 following a petition by an NGO called Kalpavriksh) states that all tree roots be provided with 6 ft space around to enable them to breathe and recharge groundwater. The National Green Tribunal too had raised the issue of rampant concretization and tiling around trees in 2013, based on a petition filed by Aditya Prasad, an environmental activist. The Ministry of Urban Development had in 2002, issued guidelines stating that concretization/ tiling should not be done on pavements except where there is heavy pedestrian movement. Even in that case, only porous tiles should be used. However, "civic bodies and the PWD do not adhere to the norms", says Padmavati. "The Forest Department agrees with the norms but the Delhi Tree Authority is ineffective in circulating the rule", she says. Whenever she notices a violation, she informs the police and Forest Department. She sees to it that the concrete and tiles are dug out immediately. She believes that the focus should be on promoting the use of designs and construction materials that can imitate some elements of the hydrological cycle instead of altering it. Many of Delhi’s alleyways need to be de-concretized and paved with porous surfacing. "The policies are in place, but civic agencies need to be geared to implement the same. That is hard to come by given the builder-government nexus, Padmavati says. In nearby Jaipur an attempt has been made at porous surfacing. The city has India’s one and only porous asphalt parking lot at the Gandhinagar railway station. There is a test section here that even integrates rainwater harvesting. Prof. Prithvi Kandhal who had helped the Franklin Institute of Philadelphia (USA) develop porous asphalt pavement technology for its parking lots, was able to persuade the Jaipur Development Authority to construct the parking lot in 2012. He put in a lot of effort to design and supervise its construction. The rainwater that percolates is stored in an underlying open-graded stone bed, which is around 225 mm thick and lets water percolates gradually into the soil below. The water lost to evaporation is minimal. The water infiltration capacity of these pavements is higher (0.8) than that of regular cropped areas (0.3). The advantage of the design is that the rooftop rainwater harvesting systems of buildings adjacent to the parking lot can be integrated into the porous pavement. The cost is 32% higher if it allows for rainwater harvesting structures at Rs 605 per sqm for porous surfacing as against Rs 457 per sqm for conventional surfacing. The difference is just 18% in case rainwater harvesting is not integrated into the parking lot. The design is useful for parking lots of institutional and residential areas. The problem is that of maintaining the top most open-graded, porous asphalt section (75 mm). According to Prof. Kandhal, the porous pavement constructed in the US still looks good and works well decades later. Even in India, the pavements, if maintained properly, can last more than 20 years. Generally, soil gets clogged and the recharge potential of the layer declines. This parking lot has worked efficiently during two monsoons but the Jaipur Development Authority has lost interest in maintaining it. Prof. Kandhal says that for recharging, groundwater, architects and town planners would have to incorporate rainwater harvesting techniques and design porous pavements. This technology can significantly use the surface runoff water from roads and parking lots for recharging groundwater in urban areas. But only if maintained well.